In a statement to SAYS, iBilik.my said it has initiated an internal investigation and lodged a police report on the "unfortunate incident"﻿. "The iBilik.my platform is intended for young adults making their first tentative steps into adulthood and it pains us greatly to see guests falling victim to fraudsters who pose as legitimate hosts," it said. "As with many other online services designed to improve lives, there have been grievous betrayals of trust committed along the way – this most recent betrayal of a user’s trust has compelled us to explore additional measures to better authenticate hosts and make the task of finding a room to rent safer for all users." As an interim measure, the platform has released a detailed set of guidelines for its users to refer to and said it has "been in active discussions with stakeholders to filter out unscrupulous hosts and produce a safer platform"
"The function of iBilik.my as an online advertising platform, as well as our current terms of service, do not enable us to bear complete responsibility for the contents of listings posted by registered hosts – but we recognise our obligation to ensure the safety of our users," the statement read. "Among the improvements we intend to implement include a mechanism where the first month's rent is held in trust until both parties are satisfied with each other." Additionally, the online advertising platform advises its users to "practice the same level of due diligence that would be necessary in any transaction involving property"
1. Verify the identities of the host, property owner, or any other parties claiming to represent them before providing any payments. 2. Be wary of being forced to interact with any lawyers or other “appointed representatives” of an absent property owner – only deal with the property owner or a licensed real estate agent. 3. Do not tolerate any duress or harassment from hosts or their ostensible representatives. 4. Do not pay any booking fees or any other charges into bank accounts belonging to any party other than the property owner. 5. Pay to the real estate agency directly and not to an individual if possible. 6. Do not give in to demands for further payments when requesting a refund. 7. If a tax charge is included, ask for the tax registration number and check if the individual or company is a tax registrant. 8. Demand to meet the other tenants, as is your right as a prospective tenant. 9. Treat a rental agreement as though it were a cash transaction – only pay once the key is delivered. 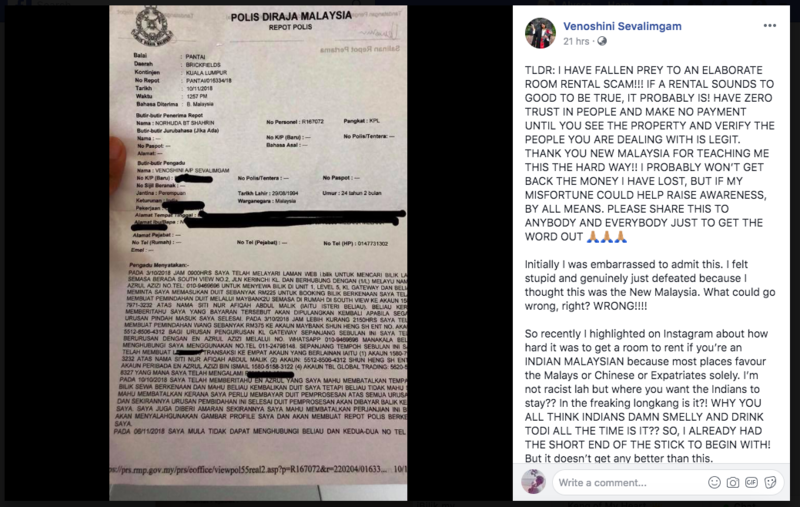 In a Facebook post, Venoshini detailed how her experience of trying to find a place to rent went from difficult to downright horrible. "Initially I was embarrassed to admit this. I felt stupid and genuinely just defeated because I thought this was the New Malaysia. What could go wrong, right?" she wrote in her post. On 3 October, Venoshini found a listing on rental database iBilik.my and contacted the "owner"
A screenshot of the platform. "I found this room ad on iBilik.my on the 3rd of October by a guy in his mid-30's named Azrol Azizi bin Ismail. I contacted this guy and he sounded genuine," wrote Venoshini. The unit was situated at KL Gateway Residences, Bangsar South. "I used to read about this [sic] scams on the news and be like who's dumb enough to fall for this kind of stuff but I guess, even the best of us sometimes become blinded by words." "He preyed on female tenants and he asked me to pay a booking fee of RM225 on the pretext that he was outstation and would like to finalise the names of the first four tenants ASAP," she wrote. "Throughout the time dealing with him, he would make me do small transactions to different accounts who he claimed to be his lawyer/wife and the management of KL Gateway Residences. To a point I got really sick and tired of him and said I wanted my money back." "That's when the nightmare started." He started blackmailing me saying that I would not get my refunds if I did not pay up. Stupid me should have cut my losses soon but chose to trust that he would give back my refund but he OBVIOUSLY DID NOT. - The "landlord/landlady" asking for a booking fee, no matter how small the amount. - The "landlord/landlady" refusing to give you their identification, instead giving you their "lawyers" identification. Keep insisting on proper identification and if they don't, then avoid them. - If they refuse to give you the other tenants' phone numbers at the very least, save yourself the trouble and ignore them. - If they tell you that they're going away abroad for three months and you get to stay rent free, don't believe it. - Don't make any transactions until you have met the person, seen the property, and verified that the property actually belongs to the said person. - If you've already made payments which they insist is refundable, and then they make you pay for more charges they claim to be tax - just cut your losses earlier on and leave. 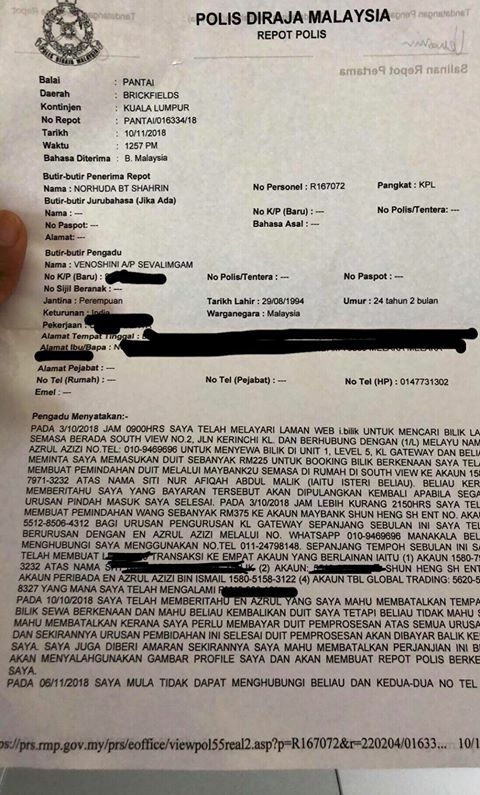 A photo of the police report that was made. "It has been rampant at the same accommodation (KL Gateway Residences) on the same platform (iBilik.my) since the beginning of 2018 with expatriates and locals falling victim to schemes with similar modus operandi. Obviously I was enraged and livid. Like how has higher authorities not taken any action on this!" she wrote in the post. 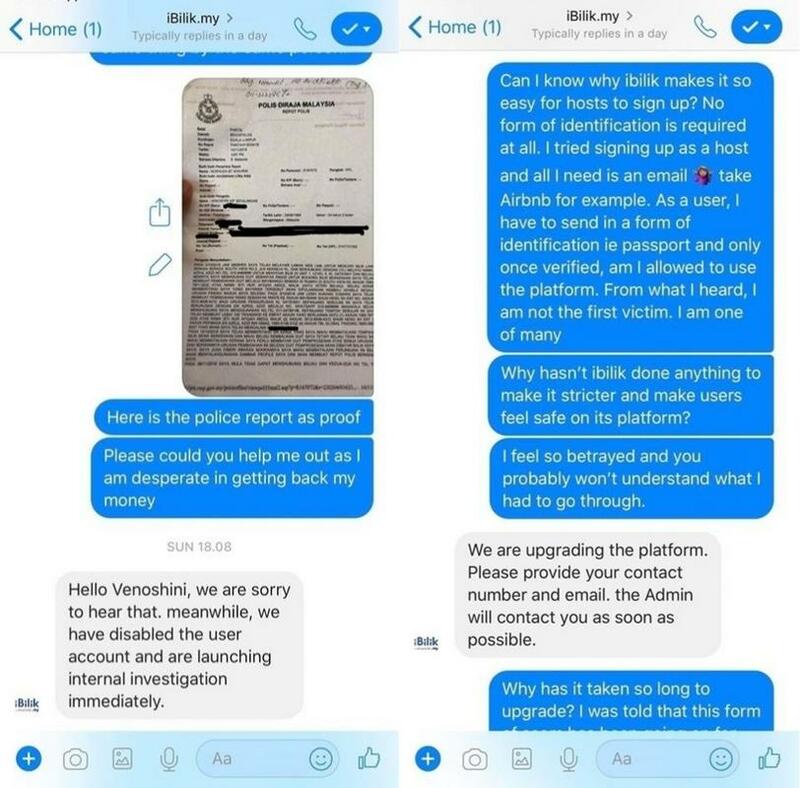 In a message to SAYS, Venoshini claimed that many cases of such scams are reported, but the police are unable to take action because these platforms "never collect legitimate documents from users when they sign up to use their service". She also questioned why it was so easy for hosts to sign up on their platform. In one message, she wrote "Why hasn't iBilik done anything to make it stricter and make users feel safe on its platform?" iBilik told her they are "upgrading the platform" in reply. Protect yourself from any exploitative practices!